Everyone loves having a supply of gifts ready to give to co-workers, friends or as a hostess gift. This Flower Shop box and cards are a perfect addition to any gift stash and it would make a fun class too! Project includes instructions for a pretty Vellum card box, two different card designs and a gift tag. 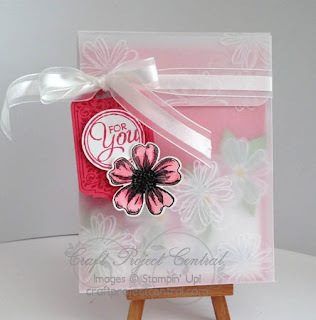 This pretty project was designed by Sharon! If you have a chance head on over to Sharon's blog and leave her a comment on her beautiful project!